Fair enough. But it’s been a hard week. A hard 48 weeks. An unbroken string of 48 hard weeks. My positive attitude has taken a bruising. And yet, what other choice do I have? In lieu of cynicism, by virtue of it not being an option, what do I do with my rage and pain? Being a disciple of emotional intelligence (EI), I’ve been struggling to understand how EI as a model can aid us in our efforts to (a) survive 2017; (b) …yeah, there is no (b), is there, if we don’t survive this year; and (c) on second thought, maybe (b) is: not just survive 2017, but keep our fight on, fully and intensely? I therefore headed back to the primers. Wiped the dust off the URLs, pulled the PDFs back off the shelves. And here, I share the results of my investigation. So, here we go: emotional intelligence. The phrase “emotional intelligence” is often attributed to Daniel Goleman’s 1995 book, but turns out it was actually coined much earlier (by Michael Beldoch in 1964, maybe? 10 points for anyone who can find me a legit source for this). But Yale researchers Peter Salovey and John Mayer started the buzz in 1990 with their article, quite cleverly titled Emotional Intelligence. It’s that third part: “the ability to access and/or generate feelings when they facilitate cognitive activities and adaptive action,” that intrigues me. Let me back up. 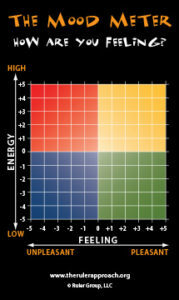 Do you know about the Mood Meter? From National Professional Resources, Inc.
It’s a tool that the Yale Center for Emotional Intelligence developed, to help people observe and track their emotional states. As you can see, “pleasantness” is the x-axis and “energy” is the y-axis, and the mood meter is divided into four quadrants based on the crossing of the x- and y-axes. At first glance, it might seem like we’d all be aspiring to be in the yellow quadrant: high energy and highly pleasant. “Happy.” “Excited.” Exuding “positivity,” basically. But not necessarily. 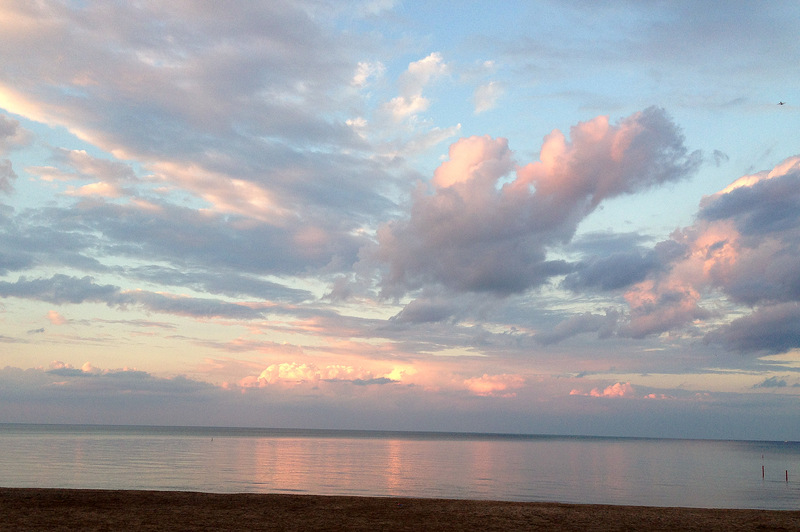 Sometimes, you might feel perfectly content to be, say, “serene,” in the green quadrant. Or “melancholy,” in the blue quadrant. Or “troubled,” in the red quadrant. Sometimes, those are the perfectly “right” moods for a given circumstance. Or they just are, and you want to maintain or productively manifest them—in service of yourself or some greater purpose. Sometimes we want to shift, say from a red “anxious” to a green “calm.” Or, we want to be the most effective we can be in a given situation, such as firing up volunteers for an upcoming fundraising event. If you’re chilling in the green quadrant, you might want to bring your energy into the yellow quadrant before entering the room. Or you need to announce the loss of a beloved community member: you might need to bring your energy down to the blue “mournful” level, intentionally. But when we’re able to take a beat to tune in to ourselves, that’s when we can ride through the hijack, imagine our best selves, and choose a strategy to respond. With a toolbox of strategies, we can harness our feelings in order to achieve our goal—and mind you, our goal could be, “to not provoke a fight with my wife” or “to make it through tomorrow’s meeting without actually losing it.” Our goal could also be, “to inspire the group to join the protest.” It’s like that thing we all know and love: anger management—except more broadly defined and more universally applicable (contentment management, inspiration management, grief management, you get the idea). The Yale Center for Emotional Intelligence suggests we pay attention to the meta-moment, those few seconds between when something happens and when we react—and use that moment to invoke our best selves and decide on a strategy to respond. 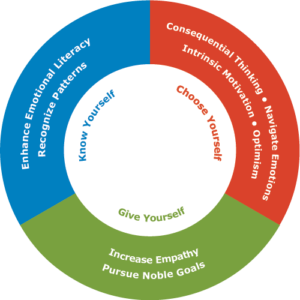 Daniel Goleman’s model includes crucial competencies in four areas: self-awareness, self-management, social awareness, and relationship-management. Josh Freeman of Six Seconds suggests turning our turbulent emotions into resources. Six Seconds also offers the virtuous Know Yourself–Choose Yourself–Give Yourself circle. So, to circle back to me trying to figure out what to do with my rage and pain (you totally forgot, didn’t you? It’s fine, I did too), there does seem to be a clear lesson from the teachings of EI. It offers a way to conceive of strategies I can practice to regulate my rage and pain, and channel them into actions that align with my values and purpose—choose adaptive rather than maladaptive strategies to achieve my goal, as Marc Brackett might say. Who’s with me? And if you care to electronically track and calibrate your moods because you’re an “apps or it didn’t happen” kind of person like me, you’re in luck. Because there’s an app for that.